1. Wash and chop the tomatoes and set aside. 2. Peel and chop the onion into pieces and set aside. oil in a wok and add the chopped onions and fry till the onions are translucent. cook till tomatoes are soft and pulpy. powder by adding little water. seeds and urad dal and let them splutter. off the heat. Pour over the chutney and combine well. i find the skins of tomatoes inedible. how to remove them? Pachadi looks yum and nice click. That looks yum. Brilliant chutney! I love tomato chutney and I always look at variations in recipes. I love your photo of the chutney. very simple,quick yet delicious chutney…love this with hot idlys a lot…looks too inviting!! Chutney looks so bright and colorful dear. Tastes great with idly. I make Tomato Chutney, but this onion addition is new to me, will try your version Chandana!! Chutney looks yumm.. very nice snap! Sounds yummy n flavorful chutney…. Great combo and nice chutney !! My favorite chutney to go with idlis and dosas. perfect click. Chutney looks good and sounds tasty. Nice and delicious chutney.loved the colour and smooth texture.. 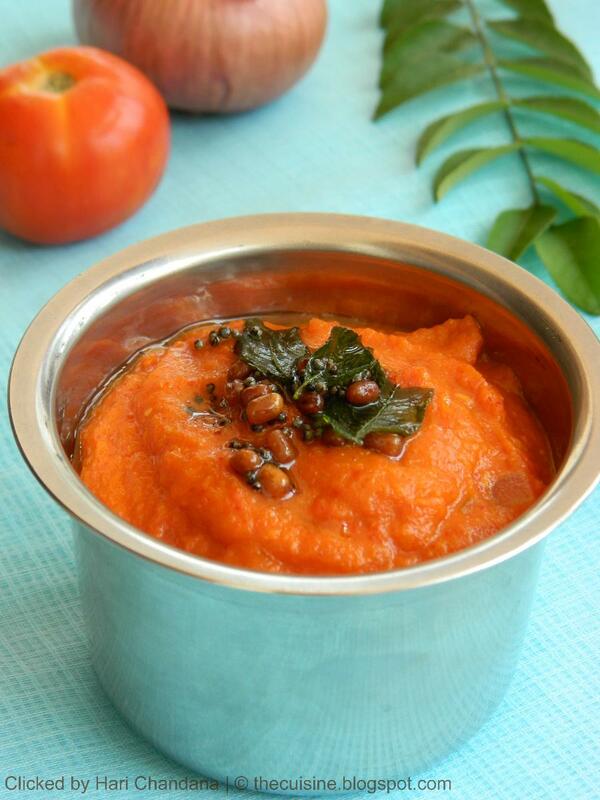 Delicious version of tomato chutney ….lovely red color! Thumbs up! Wish to have two more idlis with this chutney,delicious. Nice , easy one .. bookmarked some of ur other chutneys too..
looks yum! Lovely click Hari! Delicious looking pachadi and mouth watering presentation.